Short and so engaging, I quite loved imagining what a plant knows in this way. 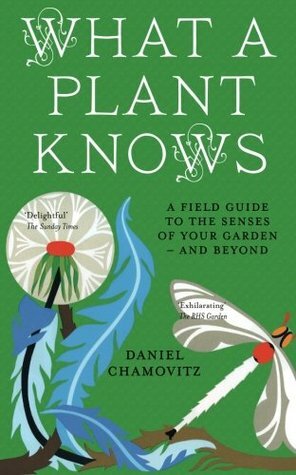 Especially as this is not an exercise in anthropomorphising plants, rather just an entry point for us non-scientists into how a plant responds to the world around it — as well as a rather fascinating way to re-examine our own senses and how we understand them. They know where the light is and at what strength. Darwin was fascinated by this, and his last book was titled The Power of Movement in Plants (1880), he was in fact fascinated by plants in general, which somehow I never knew. He and his son carried out experiments showing that a plant’s bending is caused not by photosynthesis, but by sensors sensitive to light in the tip of the plant. Even cooler is the phenomenon of photoperiodism — the fact that plants know how long they have been exposed to light — one of the signals to keep growing or to stop. Not that they are that smart — a few minutes of light in the middle of the night can make some plants flower far outside of their normal season — how else could you have chrysanthemums for mother’s day? But flowers can also distinguish between red and blue light, they in fact have 11 different photoreceptors, and can also detect elctromagnetic waves. Best fun fact? You get over jet lag faster if you spend time outdoors, because the light helps reset your circadian clock. This was pretty amazing…plants can sense odours, can emit chemicals that warn nearby leaves (and thus nearby plants) that they are being attacked by beetles or other such things and they should start producing the chemicals that beetles don’t like. They emit different chemicals when under a bacterial attack. They also receive cues about when to ripen this way, so putting your avocado or pear next to a ripe banana in a bag actually does work (science tells us, not just grandma) to ripen the avocado or pear faster. Ripening fruit emits ethylene, which tells other fruit to ripen quick — a bonanza will attract all kinds of things to your tree and spread your seeds far and wide. There is an amazing parasitical plant called Cuscuta, or the dodder plant, that can sense proximity to other plants and choose the tastiest plant best for its own health and longevity — tomatoes for instance. I like that he gives youtube video references. Darwin wrote a whole treatise on these in 1875 — Insectiverous Plants. Darwin never actually managed to figure out why the trap closed sometimes but not always — thus he failed to find the mechanism for the trap’s closing. Two of the interior hairs had to be touched in succession, ensuring the plant did not close on something too small to be worth it. A similar reaction in some ways is that of the Mimosa pudica, often called the sensitive plant, as at a touch its leaves close in on themselves and droop. In the West Indies it is known as the ‘False Death’, in Hebrew the ‘don’t touch me’ and the ‘shy virgin’ in Bangladesh. Interestingly enough, despite all that I have heard about plants loving classical music and etc, they actually probably don’t. they probably can’t ‘hear’ at all, though possibly they are sensitive to vibrations. Interestingly, this thing about music and plants lept to prominence through Dorothy Retellack’s book The Sound of Music and Plants. Not a scientist at all, she was actually more interested in proving her theories that rock music was evil than showing the effect of music on plants. Led Zepplin and Jimi Hendrix will stunt your plant’s growth she argued, and by extension your own…scientists do not agree. But plants actually move all the time, as early time lapse photography showed. Darwin himself turned his insomnia to account to show this the old fashioned way, suspending a glass plate over hundreds of species of plants and marking their position every few minutes for several hours. 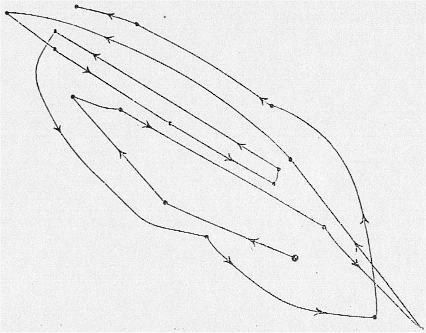 He ended with these complicated drawings showing their movements, which he called circumnutation. He theorised these movements were hardwired into all plants, and a plant’s responses to light and gravity were simply modifications of these movements. He has been proved right, plants do these movements in space, in the absence of gravity, weather, or attacking insects and bacteria. I love the idea that they are dancing around us all the time. Plants have this too in a certain form. The Venus flytrap uses it — a single touch on one of the hairs causes an electric signal, if this is followed with a touch on another hair within a certain amount of time, the trap closes. Plants can also store memory of traumatic events such as the loss of a bud or a tear in the leaf, and grow away from it. They can mark the passage of a period of cold and retain it until all other conditions are ripe for growth or flowering — if there is no cold snap, there is no flowering. They can pass mutations in response to harsh climactic conditions on to their offspring, many of whom will better survive the same stresses than the parent. These are all described as procedural memories, memories of how to do things. This is very simplified from the book, but I wanted to remember the basics of just how amazing plants are. 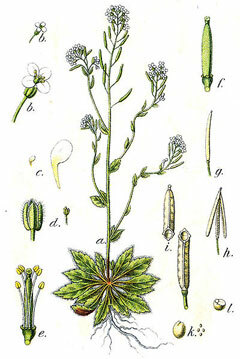 Also a shoutout to the most studied and experimented on of all plants, and the first to have its entire genetic code sequenced, the Arabidopsis thaliana.